Rookie Henry Asilum shrugged off a slow start and scored all of his 14 points in the second half to help the University of the Philippines snap a 15 game-losing-skid with a 63-48 demolition of the University of the East in the UAAP Men’s Basketball Tournament Sunday at the Smart-Araneta Coliseum. Asilum, a former mainstay of the country’s youth basketball team, delivered his best game yet to propel the Fighting Maroons to their first win since the Far Eastern University Tamaraws upset last season. Red Warrior Roi Sumang exploded for eight points in the second quarter but failed to help his team seize the lead as the Maroons’ team captain Mark Lopez, followed by forwards Alvin Padilla and Diony Hipolito, countered by scoring four points each en route to a 30-26 lead at the half. Asilum, who was scoreless in the first half, came off the bench and single-handedly gunned a 9-3 blitz to turn a threatening 32-29 lead to a 41-32 cushion with 6:02 left in the third quarter. “Ito talaga yung hinihintay namin at sana magtuloy-tuloy na kami,” said Asilum, who also contributed four rebounds and three assists. UE pounced on UP’s foul penalty and scored six free throws in a three-minute span to cut the lead, inching closer at 40-45 with two minutes left in the third frame. Skipper Mike Silungan complemented forward Paulo Romero’s jumper by scoring a trey, his only field goal of the game, to give the Maroons their first double digit lead at 50-40. The Warriors would then miss six straight charities and go scoreless in the first six minutes of the pay-off period to bury themselves to a 54-41 hole. Forward Chris Ball had his share of limelight as his three-point play capped a 7-0 onslaught and gave UP their biggest lead of the game at 61-46 with 64 ticks left. Lopez had another all around finish with 10 points, eight rebounds, four assists, two steals and a block. Sumang’s 18 point rampage was not enough to neutralize the scoreboard, with all players from the UP Squad registering baskets. 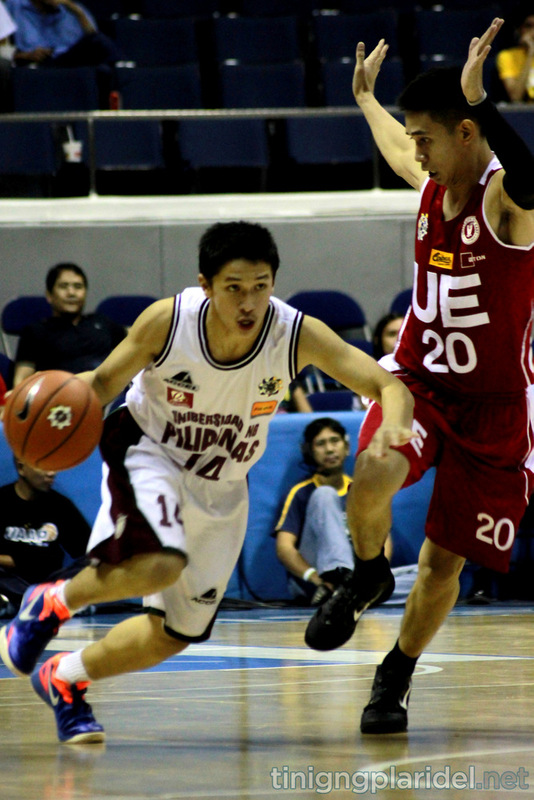 The Maroons outscored the Warriors in fastbreak points, 22-3, and converted 22 points off UE’s 22 turnovers. UP, UE and Adamson now have identical 1-6 records and are tied for sixth in the standings after the first round. The league’s second round will start on Thursday, August 23.